In a world where no other Cubs of Yore requests have ever been made, Rube Waddell is the most requested one, garnering at least three requests. Rube was one colorful character, to say the least. I first heard of Rube when stumbling across a Chip Wesley mercenary piece over at what was then The Sports Yenta. Though it's tough to tell the fact from fiction surrounding this honyack, it's one that will surely make you chuckle. Random Write-up: Rube originally made his debut in the big leagues in 1897 with the Louisville Colonels, appearing in 10 games as a pitcher in his first two seasons, before he and his teammate Honus Wagner were traded to Pittsburgh. His eccentric personality lead him to bounce around teams quite a bit, earning the nickname "Mike Morgan Before Mike Morgan Was Around". Even with his crazy persona, his services were definitely in need, as his lifetime career ERA of 2.16 boasts. His lone year in Chicago saw him go 14-14 with 26 of those being a complete game, striking out 168 with a 2.81 ERA. His short tenure in Chicago also showed that (for at least one year) he was no easy wind with the bat either. He hit .251 with 2 home runs, 14 RBI, 3 doubles and three triples in 98 at-bats. What the hell? : Sure, his baseball statistics alone look like video games numbers, and you can see why he was elected to The Hall of Fame in 1945. All of that aside, it was perhaps his zany personality and off-the-field antics that have really made his legend grow. Always known as being extremely immature, Rube struggled with the simplest of things like remembering to pay rent while in the minors, leaving the Chicago team to join a Wild West Show, going into the stands to fight someone that had taunted him, and missing practice after going on benders. If management tried to tighten the reigns on him, he'd simply quit the Major League team and sign on with a semi-pro traveling team, getting payed room and board. As tales of his success with said traveling teams made their way back to the bigs, Connie Mack persuaded him to return, even going so far as to hire the famous Pinkerton Agents to bring him back to Philly. Even in the bigs, Waddell was still known to miss starts. What could possibly keep him away? Beer? Women? Well, how about deciding to go fishing. Or challenging the local street kids to games of marbles. And let's not leave out wrestling an alligator in a nearby lagoon in Florida during Spring Training. But those were all off-the-field antics. Surely he had to be all business when he was on the mound, right? Nope. On more than one occasion, Rube would call in all the players in the infield and outfield, striking out the side. To Rube's credit, however, he only did this in exhibition games. He frequently pitched games while drunk, which is astonishing considering his numbers. 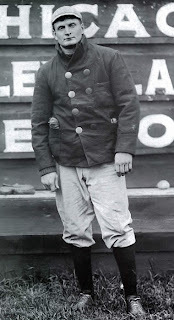 Just some of Rube's hobbies: helping fight fires, drinking, getting married, tending bar in his baseball uniform, theatre acting, fighting, leaving mid-season, saving people's lives, and leading parades, rugby, professional football player. Also of Note: Rube's 349 K's in 1904 still stands as the most strikeouts in one season for a left handed pitcher in the American League. Rube is also one of only 6 pitchers in baseball history to have back-to-back 300 strikeout seasons.